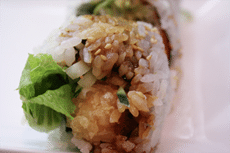 Another classic “new” roll, the shrimp tempura roll is a very popular item. I’ve seen it fancied up with lettuce and/or other items, which some people like, but a simple version is always good as well. Place one sheet of nori on your bamboo mat, with the shiny side facing down. Gently cover the nori with your prepared sushi rice, keeping the far side of the nori sheet free of rice for a width of about an inch and a half. Place each shrimp on the roll, with each tail at the opposing side of the roll. Add the avocado and cucumber evenly across the shrimp tempura. Fold the roll, keeping a careful eye in the ingredients, and as you work your way up to the top, tighten the roll by pressing down on your mat forming a somewhat square shape. Slice the roll in half, arrange the two halves together, and make three more slices (four if you think you can fit them) and you will have a six to eight piece roll. Enjoy your spicy tuna roll! Some people leave the tails on for show, though personally I find that this just gets in the wat, although they are edible when cooked.